Research Career: Dr. Bergeron began his career as principal investigator in basic science (Neuroscience) at the Ottawa Hospital Research Institute in 2002. His laboratory is committed to unraveling the understanding of the role of glutamate in the nervous system, and how this amino acid could play a role in the pathophysiology of some neuropsychiatric disorders. 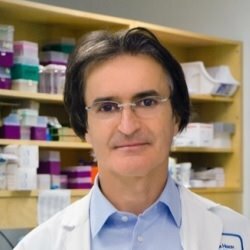 Dr. Bergeron’s research focus is dedicated in investigating the role of glycine and sigma receptor and how they modulate a subtype of glutamate receptor: NMDA receptor. The NMDA receptor is known to be involved in synaptic transmission and plasticity and has been proposed to play a role in the etiology of dementia, schizophrenia, stroke and other neuropsychiatric disorders. Alzheimer disease and ischemic stroke. Research Techniques: The laboratory of Dr Bergeron is using a number of research techniques such as: whole-cell patch-clamp technique, sniffer-patch technique; confocal microscopy, 2-Photons, calcium imaging; biochemistry: immunublotting, immunohistochemistry, co-precipitation; molecular biology: mutagenesis, RTPCR, cloning, cell culture; behavior. Transgenic Mice that are studied in Dr. Bergeron’s lab: Glycine transporter type 1 knockdown (GlyT1+/-), Serine Racemase knockout (SR-/-), Sigma Receptor type 1 knockout (Sig1R-/-), Sigma Receptor type 1 overexpression, 3 x Tg-AD harboring PS1M146V, APPSwe, and tauP301L transgenes. Education: Dr. Bergeron is a physician, a psychiatrist and a neuroscientist. He obtained his medical degree (M.D.) from the University of Sherbrooke, Quebec (1986) and certification in the specialty of Psychiatry (FRCPC) from the University of Ottawa, Ontario (1990). He completed a doctoral degree (Ph.D.) in Neuroscience at McGill University, Montreal, Quebec (1996) and trained as a postdoctoral fellow in Neuroscience for 5 years at Harvard University, Boston, M.A., USA (2002). 12. Bergeron R, de Montigny C and Blier P. (1997) Potentiation of the antidepressant effect of selected drugs by the antagonism of presynaptic 5-HT1A Receptors. International Academy for Biomedical and Drug Research, 12: 12-25. 15. Blier P, Bergeron R and de Montigny C. (1997) Selective activation of postsynaptic 5-HT1A receptors induces rapid antidepressant response. Neuropsychopharmacology, 16: 333-338. 17. Blier PR, Bergeron R and de Montigny C. (1998) Adjunct treatment for rapid onset of action and greater efficacy in major depres¬sion. In: Antidepressant therapy at the dawn of the third millennium Edited by: Briley M. and Montgomery S., London, Martin Dunitz Ltd., 279-295. 55. Khacho P, Wang B, Ahlskog N, Hristova E, Bergeron R.
59. Snyder MA, McCann K, Lalande MJ, Thivierge JP, Bergeron R. Sigma receptor type 1-knockout mice show a mild deficit in plasticity but no significant change in synaptic transmission in the CA1 region of the hippocampus. J Neurochem. 2016 Sep;138(5):700-9. doi: 10.1111/jnc.13695. Epub 2016 Jul 18. 60. Khacho P, Wang B, Bergeron R. The Good and Bad sides of NAAG. Adv Pharmacol. 2016;76:311-49. doi: 10.1016/bs.apha.2016.01.003. Epub 2016 Mar 2. 63. Zhong H, Tong L, Gu N, Gao F, Lu Y, Xie RG, Liu J, Li X, Bergeron R, Pomeranz LE, Mackie K, Wang F, Luo CX, Ren Y, Wu SX, Xie Z, Xu L, Li J, Dong H, Xiong L, Zhang X.Endocannabinoid signaling in hypothalamic circuits regulates arousal from general anesthesia in mice. J Clin Invest. 2017 Jun 1;127(6):2295-2309. doi: 10.1172/JCI91038. Epub 2017 May 2.